Cork is the bark of an oak tree known botanically as QUERCUS SUBER. It is an evergreen which grows in commercial stands only in areas bordering the Mediterranean Sea. Of the important cork producing countries, Portugal supplies approximately 50%, Spain 25%, with the balance being divided between Algeria, France, Morocco, Italy and Tunisia. As early as 2,500 BC cork was being used for fishing floats in ancient Egypt. In 400 BC cork was commonly used as stoppers for containers as well as for soles of shoes. One of the many famous users of cork was, according to reports, conqueror Alexander the Great; a cork piece once saved him from drowning when crossing a turbulent river. In these times of increased concern for the environment, cork remains the only tree which can regenerate itself after each harvest. The cork bark is stripped off 2/3 of the tree. The first harvest does not occur until the tree is approximately 20 years old. A thin layer of protective inner bark gives the cork oak its unique ability to survive and regenerate itself after the debarking process. Stripping the bark requires great skill, as the inner bark must not be damaged. A specially designed hatchet is used for the stripping process. The first bark taken from a tree is called “virgin” bark. It has a very irregular exterior surface and is grayish in color. This bark is suitable for grinding into various minute sizes ideal for cork insulation and composition cork. Interestingly, it has also become a very popular material for the manufacturing of decorative items. The subsequent strippings of the tree will take place every nine years until the cork oak is approximately 150 years old. The tree is then replaced by a much younger one. The bark which grows out after the “virgin” bark has been stripped is called “refugo” bark. It looks entirely different as it has a much smoother surface which is brown in color. The first crop of “refugo” is used mostly for grinding purposes. The subsequent strippings yield better quality cork composed of fewer and more closed pores (grains). The majority of these harvests is used for the production of cork stoppers or other items requiring a finer looking appearance. After the stripping process, the bark remains in the forest for some days to dry or, perhaps, to be inspected by potential buyers. To purchase cork bark is not an easy task as the quality not only varies from forest to forest as well as from tree to tree, but even the same tree may produce varying degrees of quality cork depending on its exposure to sunlight. Once in the factory area, the “refugo” bark is boiled to ease the removal of the woody outer layer and to make the bark more elastic in order to flatten it out – should it be sold later on. Thereafter, the bark is sorted into various thicknesses which are then, in turn, sorted into many different qualities which help to determine its sale price and/or suitable manufacturing use. Cork is a natural product with remarkably unique qualities unmatched by any other natural material. One cubic inch of cork consists of not less than 200 million completely enclosed air cells each measuring 1/1000″ in diameter. Each minute cell is 14 sided which virtually eliminates empty spaces between the cells. 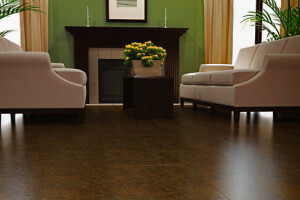 Cork has a large number of benefits over more traditional flooring products.